BBC Sport Academy | Other Sport | Rowing | Is your body built for rowing? Is your body built for rowing? Fancy a spot of rowing? Got the perfect body for rowing? Dr Kevin Thompson, physiologist at the EIS, explains the physical characteristics that make up the ultimate rower. 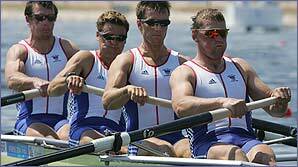 World-class rowers have long "levers" (their arms and legs) so that they can make long strokes. Male Olympians tend to be between 1.90m and 1.95m (6'3"-6'5") and females 1.80m-185m (5'11"-6'1"). They need to be strong so that they can apply a lot of force to the water on each of their strokes. The extra muscle power makes them heavy. The average weight for a male world-class rower 90-95kg (14st 2lb-15st). The women weigh in at 75-80kg (11st 11lb-12st 8lb). And that's almost pure muscle - because they don't want to carry any extra weight, rowers tend to be very lean. There is also a Lightweight category for men who weigh less than 72.5kg and women who weigh less than 59kg. These athletes are still pretty tall - men about 1.80m and women 1.70m. Coxes steer the "Eights" boats and often also give their crews instructions and motivation during the race. They must weigh a minimum of 55kg for men and 50kg for women. The rowers don't want to carry any more weight than they have to, so coxes generally weigh exactly the minimum. Are you built for swimming? Fancy trying a new Olympic sport?